Students in the Emory Law School Supreme Court Advocacy Project include (L-R): Rachel Erdman; Scott Forbes; Ed Philpot, team leader for the Petition for Certiorari; Louis Laverone, ELSSCAP executive director and leader for the Brief on the Merits; and Michael Wiseman. This is the first time an Emory student group has taken a case to the merits stage in the U.S. Supreme Court. The U.S. Supreme Court recently granted certiorari in Bullock v. BankChampaign N.A., a case brought before the court by the Emory Law School Supreme Court Advocacy Project (ELSSCAP). This is the first time that an Emory student group has taken a case to the merits stage in the Supreme Court. Students worked with Professor Sarah Shalf, ELSSCAP's faculty advisor and director of Emory's Field Placement and Professionalism programs; Thomas M. Byrne of Sutherland Asbill & Brennan, an ELSSCAP partner firm; and James Engelthaler of Thigpen, Behel, Engelthaler & Scott, counsel for ELSSCAP's client in the lower courts. The petition for certiorari asks the court to consider the degree of misconduct that constitutes "defalcation" under the Bankruptcy Code sufficient to prevent a debt from being discharged. As the only student-run Supreme Court litigation program in the nation, ELSSCAP provides Emory Law students an opportunity to participate fully in the brief-writing process. 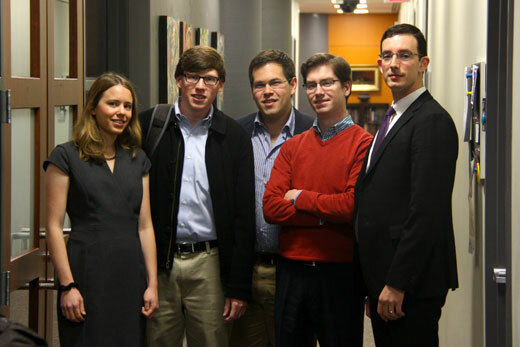 ELSSCAP joins a rare cadre of law schools that have succeeded in bringing cases before the court. "Today's achievement by Emory Law School's Supreme Court Advocacy Project highlights a core value of an Emory Law education — the opportunity to integrate theory and practice so as to make a significant contribution to society," says Robert Schapiro, dean of Emory Law School and Asa Griggs Candler Professor of Law. "Many lawyers aspire to present a case before the Supreme Court at some point in their careers. Under the guidance of professor Shalf and working with a partner law firm, our students have this opportunity while still in law school." "We are proud of this extraordinary achievement of our Emory Law students, Shalf says. "As a result of our students' legal acumen and hard work, guided by Sutherland's experienced counsel, the Supreme Court of the United States has taken on this important issue." The case concerns a family dispute over administration of a trust whose sole asset was a $1 million death benefit from the father's life insurance policy. "Under the Bankruptcy Code, 'defalcation' can be a basis for refusing to grant discharge of a debt," says Byrne, a partner at Sutherland. "In our case, there is a judgment of a state court for breach of fiduciary duty relating to a family trust, but it acknowledges the debtor had no intent to steal money from the trust, and there was no actual loss of trust principal. There is a split in the circuits on the meaning of 'defalcation'." "The granting of certiorari shows how well Emory Law equips its students to identify strong cases for the court, build those cases into strong petitions and argue persuasively before the nation's highest court," says Louis Laverone, ELSSCAP's executive director and third-year law student. ELSSCAP is a student-run pro bono litigation program that provides students the opportunity to engage significant issues that merit being heard by the U.S. Supreme Court. ELSSCAP looks for meritorious cases to take before the Supreme Court, both in seeking a grant of certiorari and in filing an amicus brief to add additional perspective on an issue in a given case. For additional information contact Benjamin Smyser, director of outreach, 646-270-9943.